The WIAA is pleased to announce Deer Park Middle School's Cole Krepcik and McLoughlin Middle School's Mattalee Woolf as the February “Give Me 5” Star Students of the Month. 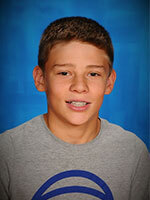 Cole Krepcik is a seventh grade student athlete attending Deer Park Middle School in Deer Park, WA. Krepcik participates in football, basetkball, and baseball for Deer Park MS. He takes pride in his school through participating in sports and demonstrates outstanding sportsmanship. Krepcik is a respectful young man towards his teammates and coaches. Participating in DPMS’s athletics, Krepcik guides his teammates and holds them all to a high moral standard. He demonstrates grace and the meaning of being humble when winning and in the event of defeat makes it a priority to congratulate his opponents while wishing them the best of luck moving forward. Creating and retaining positive relationships with coaches and peers is one of Krepcik’s priorities along with showing his gratitude to his teammates. He continues to be a leader with integrity on and off the court/field. “He does the right thing even if no one is watching him. I believe he is a pivotal member of his peers and he inspires them to all be better people,” says DPMS’s Athletic Director, Chris Snyder. 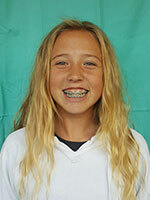 Mattalee Woolf is a seventh grade student attending McLoughlin Middle School located in Pasco, WA. Woolf participates in several athletics at McLoughlin MS such as, basketball, soccer, and softball. Not only does Woolf play basketball for her middle school, she plays for a club basketball team as well. Woolf stands out among her peers due to many reasons that take place on the field/court as well as in the halls and in the Pasco community. Woolf is a young woman filled with a lot of love for reading and her family. She continues to show and spread her adoration when she is helping others less fortunate. Woolf makes meals for those in need, helps with yardwork for those who can’t do it themselves, and continues to show respect for anyone she comes in contact with. Woolf cares about doing her best and making a difference, she is an epitome of a student-athlete. Athletic Director, Gregg Huisingh, raves highly of Woolf’s outgoing, kind, and positive personality.